Shy and quiet, the mouse is generally embarrassed to even be in the room with people. The Mouse is the person that usually comes from an upbringing where his parents have told him that it’s impolite to talk about money. A mouse is more likely to suffer in silence about his financial woes than he is to seek help. Nearly everybody was a mouse at one point, but once a mouse gets over his skittishness, he’ll usually pick up the traits of one of the other animals. The only way it could be worse for a mouse is if they are a cow. In some parts of the world, cows are sacred, in other parts they are slaughtered. When it comes to personal finance, cows are the ones that follow the herd, and when they get spooked, they stampede. When it comes time to invest money, cows are usually the people who shout “sell” and panic when the markets make a slight correction. Most of the investment advertisements you can hear on talk radio is aimed at the cows, as they want them to come together, get spooked, and start a massive sell-off, or stampede. You can reason with a cow, but they won’t always listen. To get them to respond, you have to motivate them with fear. We all know a Rattlesnake or two. The rattle snake is the person that it wouldn’t surprise you if they had a fully stocked bunker in their basement, with a “Don’t Trust Anybody” bumper sticker on the door. Rattlesnakes will preach about how personal finance is all about going to only pay cash for anything, and keeping gold and other precious metals as an investment vehicle. The reason I call these folks rattlesnakes is because like a rattlesnake, they’ll sit there, coiled up and making noise, causing other people to worry. Be careful with the advice of rattlesnakes – all their worrying is like a rocking chair: it’ll give you something to do, but it won’t get you far. The best thing to do around rattlesnakes is true in both cases: just get away and let them be. You can’t reason with a rattlesnake, and it’s better not to get bitten. If you hang around a personal finance forum or blog, you’ll run into a peacock sooner or later. Normally, they’ll start a post with something along the lines of “How Am I Doing?” and then discloses that he has several million in his retirement accounts now. It’s hard to feel sorry for the peacock, but they are typically looking for acceptance, and are probably just trying too hard. The peacock will generally have his finances in order, but he’ll be rich and lonely (and possibly poor later in life) because of the way he flaunts his good fortune. In general, the peacock is either a liar or a jerk, sometimes both. Don’t be a peacock. 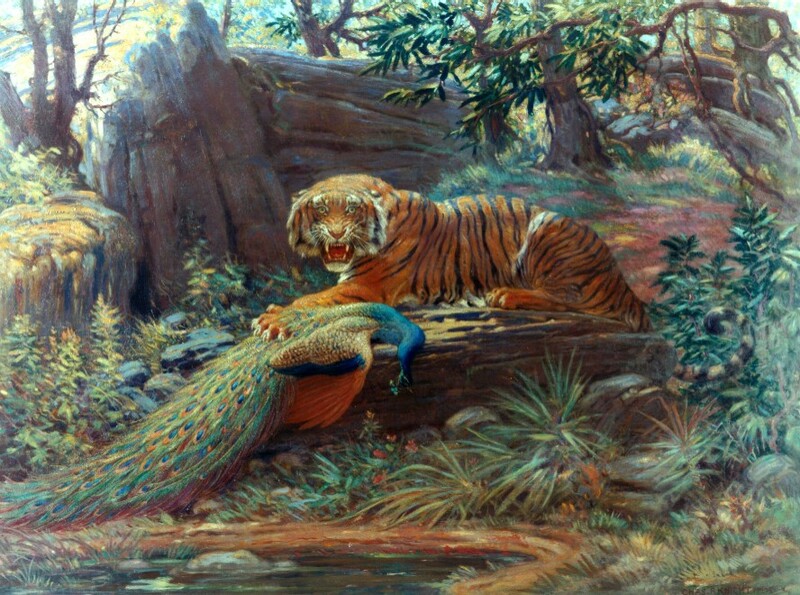 Tigers will eat a peacock for lunch. Slow and steady, the turtle is trying to win the race. Paying off debt and being conservative in his investments, the turtle is moving himself towards a retirement, albeit slowly. The turtle has likely read several personal finance books, and has taken the general advice to heart, thinking that live is long and hard, so you should keep your nose to the grindstone. Turtles will clip coupons, save hard for their house and car, and save any tiny slice of their salary that remains into a 401(k) plan. A turtle will pray that nothing goes wrong in the 50+ years of career work that it will take to get himself enough savings to enjoy a brief retirement. There are worse animals to be than a turtle, but like turtles, the plans they make would be better suited to them if they shared the same life span. Being a tiger is one of the greatest financial feelings in the world, but it doesn’t come easy. A tiger won’t go and waste money, but instead plans his early retirement by knowing that if he saves 50% of his take-home pay, he could retire in 17 years, or if he saves 75%, he can retire in just 7 years. Knowing this, and knowing the rules of the game make a tiger the force to be reckoned when it comes to personal finance. ***A great example of a tiger attack is what happened when the U.S. Mint sold dollar coins direct to consumers online, in boxes of 250. With no shipping or processing fee, tigers would use their rewards cards to get the airline miles or cash back, and immediately deposit the money in the bank and pay off their credit cards. With the only costs being a trip or two to the bank, they were able to rack up millions of airline miles to be used for things like lifetime status, trips to Tahiti, and free flights all over the world. Unfortunately, the U.S. Mint put an end to the program. Until next time, snack on some more debt! Understanding Cash Flow, or How to Make (a Little) More Money From What You Already Have. How do you optimize your monthly cash flow over several months with an income of X dollars per month, paid in 2 equal installments of X/2 over the course of each month, when you have monthly expenses of .75(X)? The answer of course is to maximize the resources you have. A 1.5% discount on your spending might not seem like much, but it’ll make for a nice start when you’re looking to save up. Basically, this question is about being able to understand and allocate resources in an efficient manner. So, how do you solve this problem? Balances from Card 2 should be transferred to Card 3, and paid off on the last day of the grace period. The existing balances should be paid off at a rate of .25(X) per month, to minimize interest. After balances are paid off, you should be earning 1.0253(1/12) * (1.5 X + .26125(X*N-1) + (previous months’ interest)) each month, since you now are able to keep your cash for ~45 days (1.5 months), and thanks to the cash back, you are spending 73.875% of your income on expenses instead of 75%. N represents the number of months since all cards were paid off. Card 2 would be kept open and paid off, both for emergencies, and to lower your utilization. Moved the high interest debt to a lower cost opportunity, including 15 days interest-free. Change the spending habit to put the monthly expenses on a card that gets cash back. This has the net effect of either lowering the amount you pay for things, meaning instead of spending $75 of every hundred dollars, you’re spending $73.875. Now, we’re aggressively attacking debt, meaning debt will get paid off in the shortest time frame possible with our available resources. With a low-limit card, a bit more breathing room will make sure you can afford to put as many of your expenses as possible on the card and earn cash back. Your monthly account interest is 1/12 of 2.53% Annual Percentage Yield, so to get that, we use the compound interest formula of 1 + interest rate ^(period). ii. .26125(X*N-1) – Your Monthly Savings Rate (100-73.875=26.125) times the total number of months (N) since you paid off your credit card debt, minus 1 (which is included in the three bi-weekly paychecks. iii. The sum of the interest paid to you for the last N-1 months. All of this is a very powerful system. Now, instead of paying around $30 in interest each month, you’re getting $15 from the credit card company, usually applied to the balance of your purchases. Depending on the card, your own spending habits, and the offers available you could end up with double or even triple that amount. The key to all of this is ensuring you keep your credit cards paid off each billing cycle. By doing this, you’re holding on to your money as long as possible, being paid by companies for the privilege to loan you money interest-free, and earning interest. Until next time, eat a little more debt.